This the fourth of four blogs written in advance of a meeting at the ETH conference facility in Ascona, Switzerland, to discuss four related questions about the evolution of the solid Earth: “When did Plate Tectonics Begin on Earth?”; “How Did Plate Tectonics begin?”; “What was Earth’s Tectonic Style before Plate Tectonics Began?”, and, this post: “Why Is It Important to Understand When and How Plate Tectonics Began on Earth, and What Came Before?” More information about the meeting is online at http://jupiter.ethz.ch/~plates/. The Earth experienced a magma ocean as a result of the Moon-forming impact, and that was the starting place for the formation of our mantle and crust, and set the stage for tectonics. The magma ocean solidifies such that denser material overlies more buoyant material, and as this unstable mantle overturns in the solid state to gravitational stability, buoyant hot mantle material likely rose toward the surface and melted, producing Earth’s first basaltic crust. The Earth had to cool significantly to allow plate tectonics, and in the mean time, lithospheric dripping may have provided a kind of sluggish carbon cycling, and may even have provided the right conditions for life. FIRST, WHAT WAS EARTH’S STYLE OF TECTONICS BEFORE PLATE TECTONICS? 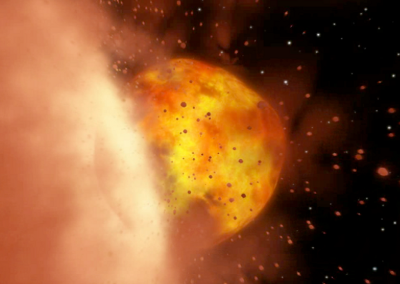 Figure 1: Artist’s conception of the state of the Earth just after the Moon-forming giant impact: no crust, just magma (frame from video, C. Lisse, APL). Let’s start at the very beginning, with the freezing of the last magma ocean, and work forward. Accretionary impacts likely create serial magma oceans on growing rocky planets. The magma ocean stage sets the initial interior and exterior volatile inventories of rocky planets, and the volatile inventory in turn affects all aspects of tectonics and climate. The Moon-forming impact may have melted the entirety of the Earth’s mantle, or close to it (Canup, 2008) (Figure 1). This is the starting place for the Earth’s crust, and for the conditions that lead to plate tectonics. Some critical parameters for determining the patterns and effects of mantle convection and plate formation are the compositional and thermal heterogeneity of the mantle, the composition and thickness of the crust and lithosphere, and the surface temperature of the early Earth. Do we know any of this with certainty? Absolutely not. Do we have ideas? You bet. First, the magma ocean needs to freeze (a summary of the models of physics and chemistry of magma ocean solidification can be found in Elkins-Tanton, 2012). The freezing of a magma ocean will leave some concentration of volatiles in the planetary interior. Each mineral phase solidifying in the magma ocean has its specific ability to accept hydroxyl or other incompatible elements or compounds, and interstitial liquids will trap a further volatile fraction. The interior volatile inventory of a planet, in particular its water inventory, controls the mantle viscosity, and thus convective vigor and degree of coupling between the mantle and lithosphere. This interior inventory may be decoupled from surface conditions to some degree, however. A thick lithosphere can prevent significant volcanic degassing. A close proximity to the star can remove atmosphere. Thus, though Venus’ surface is drier than the Earth’s, its interior may be similarly volatile rich. Whether the magma ocean solidified through fractional crystallization or batch crystallization, the resulting solid mantle will be gravitationally unstable. The newly solid mantle will have a temperature gradient along its solidus, and for planets larger than, say, Mercury, the solidus is sufficiently different than the adiabat that the surface materials will be denser than materials further down (Solomatov, 2000). If the magma ocean solidified via fractional crystallization, the density gradient will be even greater, as iron is blocked from entering deep, early crystallizing phases, and builds up in solids closer to the top of the mantle (Elkins-Tanton, 2008; first discussed for the Moon, see Schnetzler and Philpotts 1971; Spera 1992; Hess and Parmentier 1995). These gravitationally unstable, hot mantle materials will flow in the solid state to gravitational stability over the course of a few million years. This overturning process can deliver dense, cold, incompatible element rich material to the core-mantle boundary, creating a core flux sufficient to drive a magnetic dynamo, and producing a dense layer at the core-mantle boundary that may persist over the age of the solar system, not participating in thermally-driven convection (Brown et al., 2014). Simultaneously, hot upwelling material may melt adiabatically and produce the planet’s first basaltic crust (Elkins-Tanton et al., 2005). Figure 2: Planets the size of the Earth likely grew their first crust through mantle melting during overturn of magma ocean cumulates. (From Elkins-Tanton, 2012, Annual Reviews, figure 7). There are then several ways a body would obtain its initial crust. Planetesimals may have an unmelted primitive lid over an internal magma ocean. Bodies of embryo size, such as the Moon, have a sufficiently small internal pressure range that they may produce plagioclase that floats to form an initial crust (in the Earth’s larger pressure range, plagioclase is not stable until too late in solidification, and there is no other floating mineral phase). Larger bodies, like the Earth, can obtain an earliest basaltic crust through decompression melting during overturn of gravitationally unstable magma ocean cumulates, or through later thermal convection (Figure 2). All of these processes for crustal production are tied to magma oceans, either directly or indirectly through remelting of magma ocean cumulates. Once overturn is complete, the compositionally stable mantle is resistant to the onset of thermal convection and may remain quiescent for a period of time (Zaranek and Parmentier, 2004). The image of a violently convecting early planetary interior may therefore be at least delayed by magma ocean solidification. Without vigorous mantle convection, the top thermal boundary layer may have a chance to thicken enough to suppress or delay plate tectonics. Single-plate planets appear to dominate our solar system. Now we have an early Earth with a hot but gravitationally stable mantle, and a basaltic crust, and a hot steam atmosphere. Not ideal for plate tectonics! These early stages are discussed via the terrestrial rock record, Venus, and numerical models by the previous two blogs (Gerya and Bercovici). Rather than approaching plate tectonics from the point of view of mantle convection, the problem may be thought of as the balance between brittle fault development and annealing (Bercovici and Ricard, 2014). The maintenance of brittle faults is required to keep plates separate and able to move, and so both hotter mantles (as in young planets) and hotter surfaces (for example, Venus) will suppress plate tectonics (Foley et al., 2014). Slow recycling, through dripping lithosphere, may be normal on one-plate planets (Figure 3). Such lithospheric dripping can produce both volcanism and volatile recycling (Elkins-Tanton, 2007). On the Earth, this mode is thought to have slowly changed to modern plate tectonics as the surface cooled and mantle convection increased. Figure 3: Dripping lithosphere can trigger magmatism, and may form a slow method for both carbon cycling and atmospheric rejuvenation. SECOND, WHY IS IT IMPORTANT TO KNOW WHEN AND HOW PLATE TECTONICS BEGAN? Hmm. Having this question posed to me brings back images of the qualifying exam … let’s see. Plate tectonics is commonly asserted to be necessary for life. We’d like to look for plate tectonics and for life on other planets. I think that’s my simplest answer. We are not sure exactly when life began on Earth, but it was at least 3.5 billion years ago. Could earlier evidence have been destroyed by surface processes? Of course, but can we link life to plate tectonics? No, we can’t. Plate tectonics is necessary for the carbon cycle that keeps the Earth at habitable temperatures by sequestering carbon in limestone in oceans, and parceling it back into the atmosphere through volcanoes. 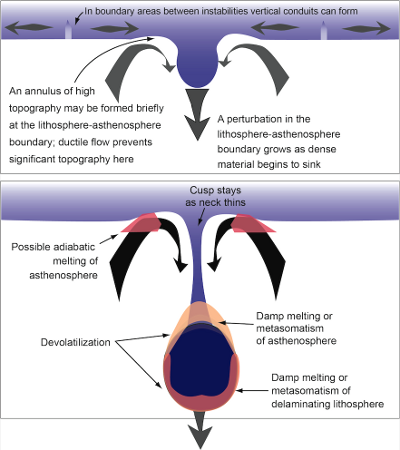 There may be, however, other tectonic processes that cycle carbon into a planetary interior and back to the atmosphere; one possibility is small-scale convection that returns lithospheric material to the mantle and produces small-scale volcanism (Figure 3). Whether this process is sufficient to stabilize climate on one-plate planets or planets with sluggish convection remains to be demonstrated. How do we understand the meaning of habitability when there is only one example? All clues seem significant: the common need for the existence of water, the range of temperatures over which life on Earth is found, and the chemical cycles that maintain the surface and near-surface of the Earth within that range. Here’s a more fundamental question still. How is the heat energy of a planet turned into the biological energy for life? It was only during a class last fall when my brilliant colleague Everett Shock explained this to me. The heat engine of the Earth moves rocks from the interior to the surface, such as magmas at mid-ocean ridges or on continents, or slices of oceanic crust and lithosphere shoved onto continents through collisions. These rocks are not at equilibrium at the surface (think of chemical weathering; olivine and other mantle minerals weather away) but the relatively cold surface temperatures freeze the disequilibrium in for some time. Non-photosynthesizing, single-celled life uses catalysts on these materials to speed the return to equilibrium and thus harvest the chemical potential energy. Thinking of simple single-celled organisms living on the chemical potential energy of mixing planets as they lose their accretionary and radiogenic heat makes possible dreams of many scenarios. Could there be single-celled life living on the flanks of Mount Olympus on Mars, drinking the briny ground water and eating the chemical potential of lavas? Perhaps this is a good final scene for a series on plate tectonics: the critical results of plate tectonics, including carbon cycling, rock delivery to the surface, and interaction with water, encompassed in a non-plate-tectonic scenario on another planet (Figure 4). Figure 4: Possibly the most likely kind of extraterrestrial life, and also terrestrial life: single celled organisms under ground. 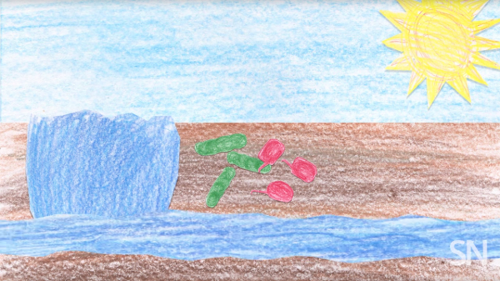 Image from video by E. Otwell, H. Thompson, Podington Bear for Sumner (2016) https://www.sciencenews.org/article/how-alien-can-planet-be-and-still-support-life. Bercovici, D, and Ricard, Y. 2014 Plate tectonics, damage, and inheritance. Nature, 508, 513-516. Brown, S., LT. Elkins-Tanton, R Walker, 2014. Effects of magma ocean crystallization and overturn on the development of 142Nd and 182W isotopic heterogeneities in the primordial mantle, Earth and Planetary Science Letters 408: 319-330. Canup RM. 2008. Accretion of the Earth. Philosophical Transactions of the Royal Society A: Mathematical, Physical and Engineering Sciences 3366: 4061-75. Elkins-Tanton LT, Hess PC, Parmentier EM. 2005. Possible formation of ancient crust on Mars through magma ocean processes. Journal of Geophysical Research-Planets 110. Elkins-Tanton, L. T., 2007. Continental magmatism, volatile recycling, and a heterogeneous mantle caused by lithospheric gravitational instabilities, Journal of Geophysical Research 112, B03405, doi:10.1029/2005JB004072. Elkins-Tanton LT. 2008. Linked magma ocean solidification and atmospheric growth for Earth and Mars. Earth and Planetary Science Letters 271: 181-91. Elkins-Tanton, L.T., 2012. Magma oceans in the inner solar system, Annual Review of Earth and Planetary Sciences 40: 113-139. Foley, B., D. Bercovici, L.T. Elkins-Tanton, 2014. Initiation of Plate Tectonics from Post-Magma Ocean Thermo-Chemical Convection, Journal of Geophysical Research, Solid Earth 119: 8538-8561. Hess PC, Parmentier EM. 1995. A model for the thermal and chemical evolution of the Moon’s interior: Implications for the onset of mare volcanism. Earth and Planetary Science Letters 134: 501-14. Schnetzler CC, Philpotts JA. 1971. Alkali, alkaline-earth, and rare earth concentrations in some Apollo 12 soils, rocks, and separated phases. Lunar Science Conference 2. Solomatov VS. 2000. Fluid dynamics of a terrestrial magma ocean. In Origin of the Earth and Moon, ed. RM Canup, K Righter, pp. 555. Phoenix: University of Arizona Press. Sumner, T. 2016. How alien can a planet be and still support life? Science News 189: 36. Zaranek SE, Parmentier EM. 2004. Convective cooling of an initially stably stratified fluid with temperature-dependent viscosity: Implications for the role of solid-state convection in planetary evolution. Journal of Geophysical Research 109.